If the forsythia was cut from the front of my building where I happen to pay rent it's not stealing, right? ...because they are already cut, in a vase and now blooming in my house. Love forsythia. I need to bring some in out of my yard. I keep putting it off and it is going to be gone before I do it! I also love forsythia. And yes, I think cutting some from your building is fine. But what do I know? I got a B in Ethics. I love forsythia! I have a huge bouquet of branches in my living room... Did a whole post on them a while ago too! coulda included yours! BTW, they dried beautifully! You cant even tell they are dead. Just dont touch them cause they make a huge mess! Oh, good reminder to snip some from my yard today, too. I only have a small plant but it will look really pretty inside! Last week I spent $16 on flowers from the Fresh Market, and they were dead in 3 days. Meanwhile, my camellia just keeps on blooming- for free. I'll be scouting the neighborhood for a forsythia bush tonight. Your vignette looks really cute! So pretty! all that's in front of my building is cigarette butts from the bar downstairs :( Lucky girl! they bring you more joy than they could have outside. so its all good. ps- love that brass(?) tray behind the flowers! Just think that you are helping to keep it groomed. 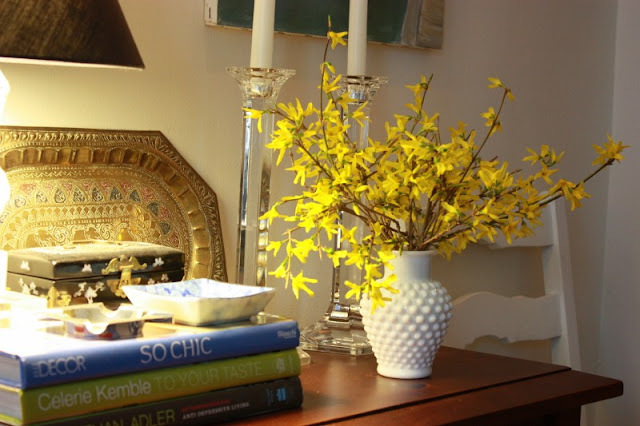 Love forsythia and am tempted to get one- if only to have a plant to cut from periodically! So pretty! My mom has forsythia bushes in my parents' front yard. They're a welcome sign of spring! love them... yellow always brightens up your space... love where you put them too! definitely not :) love it! Last week I did the same thing....from out front of my apartment, but hanging over my fence from the neighbor's yard. ;) Hope that's not too horrible of me! what a pretty vignette. Ours isn't blooming yet...I hope a late trimming at the end of last season didn't ruin them for this one! Shari- you are so right! I know that you all certainty enjoy it more then my boyfriend- he doesn't notice these kinds of things. Haha! definitely not stealing... they're provided for people like yourself who appreciate their beauty... or at least that's what I'd tell myself. Love forsythia! 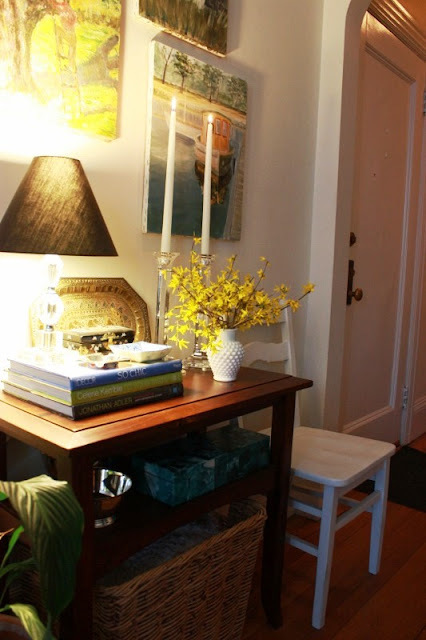 So pretty in your entryway! Beautiful! My mom's house has a large forsythia bush...I look forward to it blooming every year! Totally legit...and I loooooove that milk glass vase! They look beautiful! And to make yourself feel even better...when you cut and trim shrubs it makes them even grow harder and stronger...so more of the flowers and branches will be happening...because of YOU! Yay!!! yes so go put them back!! They are beautiful in fact they look so good I hope they stay fresh for a long time. They make your already beautiful space look even that much prettier. Your vase and your books are so pretty right there! P.S. Be sure to enter my first GIVEAWAY! Very pretty and don't feel guilty! I really like seeing a peek at your lovely home. Great design books! i have forsythia 'scapin in my house too. Definitely not stealing. :) And they look beautiful! Stealing? Hardly. It's called pruning, my darling. And you were simply recycling the cuttings. What a very pretty vignette; that springy punch of yellow is lovely and so tempting that it can hardly be thought of as stealing... especially if you live there! Oh, it's not stealing, it's borrowing because I'm sure you're going to put it back when you through with it ! 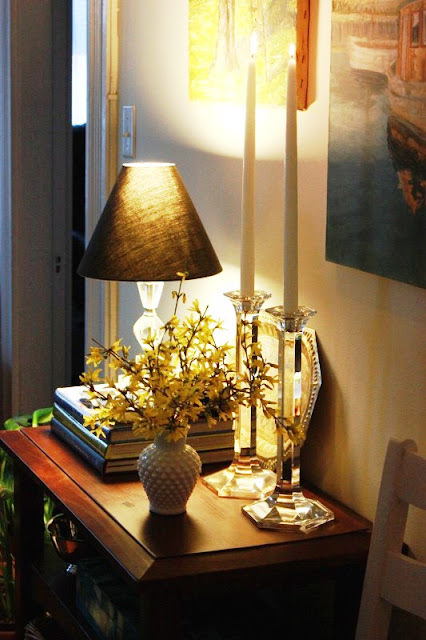 Beautiful, and definitely not stealing:) Love you table vignette, the branches are the perfect finishing touch!